Lots of news to share with you this month, starting with the recent announcement of an eighth straight year without a tuition increase. 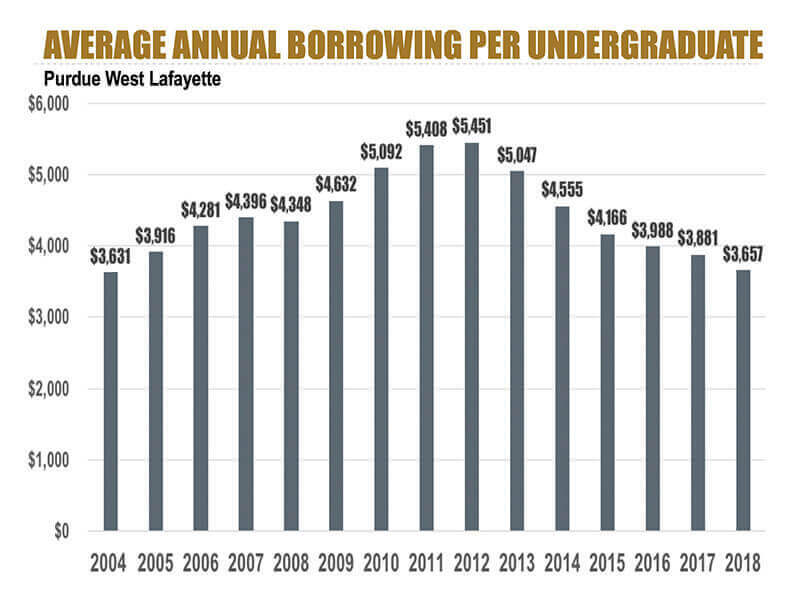 With tuition held at 2012 levels through at least the 2020-21 academic year, six graduating classes will have earned their Purdue degrees without ever having a tuition increase. 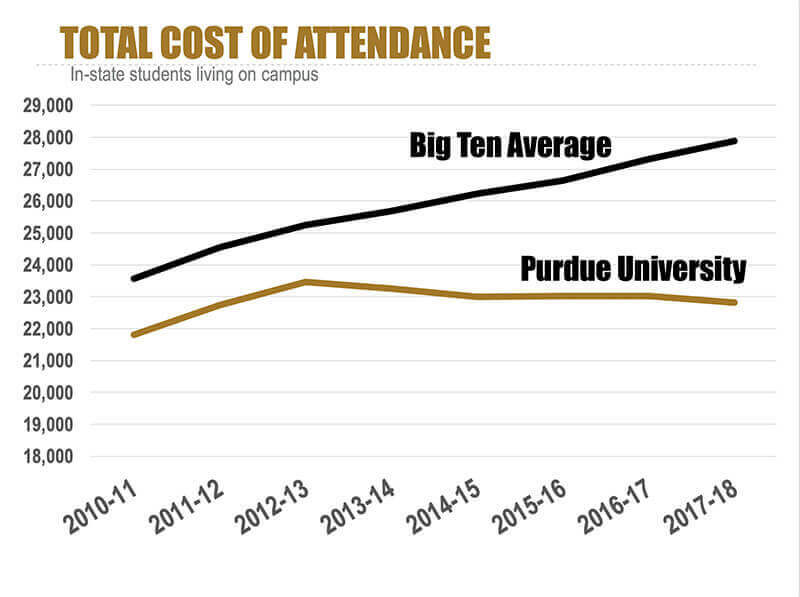 And combined with lower room and board rates, it now costs less to attend Purdue than it did in 2012. The last time a tuition increase was announced at Purdue, today’s freshmen were in elementary school. In that time, total student borrowing is down 31 percent, and the loan default rate three years post-graduation for our graduates today is 0.8 percent compared with 2.5 percent for May 2011 graduates. As we’ve often said, we believe holding the line on tuition for our students and their families is the right thing to do, so long as we are balancing our operating budget, growing our faculty, investing in research and necessary capital projects, and increasing compensation competitively. To that point, this will be the fifth straight year Purdue will offer a merit raise pool (2.5%) for our faculty and staff, and all staff on our campus making $75,000 or less will receive a $500 appreciation payment this spring in recognition of their efforts and commitment to making our affordability policies a reality. National data demonstrating the sad ignorance of students and even college graduates everywhere about the history and workings of our democracy are not new. While no American should leave middle school without at least a basic knowledge of such matters, the reality, as observed by people of all political stripes, is quite different. Just this year, the Woodrow Wilson Foundation found that a majority of people in every state except Vermont would fail the U.S. citizenship test, with the percentage earning an “A” grade in the single digits for all 50 states. A 2016 survey by the Annenberg Public Policy Center at the University of Pennsylvania found that just 26% of Americans can name all three branches of government. In 2011, Newsweek reported that 70% of Americans didn’t know that the Constitution is the supreme law of the land. A 2015 study by the American Council of Trustees and Alumni (ACTA), found that 40% of college graduates did not understand that Congress has the power to declare war. States like Florida and Missouri have already mandated by law that their university students be able to pass a test like the citizenship test given to newly naturalized U.S. citizens. With all this in mind, I’ve asked the University Senate, our faculty governing body, to advise us on ways of ensuring that Purdue students are exceptions to the national pattern. My initial proposal to that group is that we simply hand each entering freshman the same 100-question manual given to immigrants reaching naturalization, with four years to pass a test abstracted from it. The Senate has agreed to work quickly to consider this and other options, and we hope to have a “civics certificate” option in place by fall. There are numerous details to consider — Should this be required of all our students, including international students? What level of knowledge should we require as a passing grade? — and we’re open to ideas and suggestions, from our faculty and from you. Earlier this month we announced an exciting new partnership between Papa John’s and Purdue University Global. Through a new tuition benefit program, Papa John’s will pay for 100 percent of tuition costs for any of its 20,000 corporate team members and a significant portion of tuition costs for its 70,000 franchise team members who wish to pursue an undergraduate or graduate degree via Purdue Global. A similar partnership is already in place between Purdue Global and national security contractor ManTech, with several more to be announced in the coming months. These are the kinds of partnerships we hope to see more of, and it’s an excellent example of how Purdue Global can serve the needs of the millions of Americans who otherwise wouldn’t have the opportunity to pursue higher education and those of employers who need educated and trained workers. This both provides Papa John’s team members with a career growth opportunity and sets Papa John’s apart in the marketplace as an employer. Congratulations are in order for Suresh Garimella, who will be leaving his post as executive vice president for research and partnerships at Purdue to assume a new role as president of the University of Vermont on July 1. We are extremely proud that Purdue produces the type of leaders that are recruited and wanted at other highly regarded institutions, but, as is always the case, these leaders are difficult to replace. His impact at Purdue has been immeasurable, leading most recently the ambitious Life Sciences Initiative, establishing two new institutes that bring together faculty from dozens of disciplines to study integrative neuroscience and inflammation, immunology and infectious disease, and helping establish the Integrative Data Science Initiative. I am not exaggerating to say that Suresh will be among the most difficult of Purdue’s leaders to replace. Please join me in wishing him all the best as he begins this next exciting chapter. I hope by now you’ve had the chance to check out some of the great new offerings the Purdue Alumni Association has rolled out over the past few months. After two years of strategic investment, research, and candid conversations with graduates, the association is moving beyond the traditional "one-size-fits-all" membership with a new, tiered membership system that offers benefits to fit each member's personal, professional and intellectual needs, based on their stage of life, goals, interests and budget. It’s a giant leap forward in alumni engagement. New benefits include improved and expanded professional development tools and resources, upgraded networking opportunities, leadership assessments and online learning discounts. Especially exciting are the new Professional and Career Max membership options to further support the career development and lifelong learning of our alumni. If you haven’t yet seen the new membership options, I encourage you to check them out at purduealumni.org/member. Thank you to everyone who has joined us so far, on campus and online through our livestreams, for the many Giant Leaps and Ideas Festival events over the past several months. Just this week, our alumnus Captain Chesley “Sully” Sullenberger enthralled a packed Elliott Hall of Music with the story of his landing on the Hudson River and the lessons he learned at Purdue that were relevant during that epic accomplishment. Spring is packed with more exciting opportunities to learn and ponder alongside some world-renowned scholars and thinkers, and I hope you’ll be able to join us. Some highlights over the next few months include astronaut Scott Kelly on March 5, author and activist Michael Pollan on March 20, the 20th Annual CERIAS Security Symposium on April 9-10, a colloquium on ending global hunger on April 10-11, and NASA associate administrator for human exploration and operations Bill Gerstenmaier on April 25. A full schedule of events is available at takegiantleaps.com/calendar. Boiler Up and Hail Purdue!